This recipe is courtesy of American Heritage and will make approximately 60 small squares of chocolate fudge. "Boil until it's sugary on the sides of the pan and puffs up and is thick," is all the undated manuscript offers. We offer the following elaboration: Combine sugar, milk and AMERICAN HERITAGE® Chocolate Drink Mix in a medium saucepan, stirring constantly. Bring to a boil. Reduce heat and simmer. To check if it's done, drop a small ball into a bowl of cold water. It should form a soft ball. Or use a sugar thermometer and cook until 240 degrees F. Remove from the heat and beat well with a spoon. The mixture should be very thick and about to set. Pour into a greased 8x8-inch baking pan and let cool. Cut into squares and serve. AMERICAN HERITAGE Chocolate is an authentic historic chocolate made from ingredients available in the 18th Century. The recipe repre­sents a true taste of chocolate the way our ancestors would have enjoyed it. 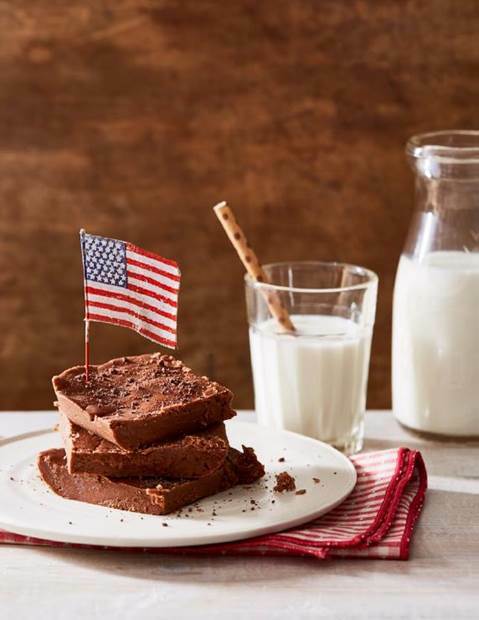 Made with all-natural ingredients and no preservatives, AMERICAN HERITAGE® Chocolate comes in four unique formats: chocolate sticks, chocolate bites, chocolate baking/grating blocks, and finely grated chocolate drink mix. This sounds like an easy way to make fudge. I have never tasted American Heritage chocolate. I wonder how much sugar is in the drink mix. Not much. I used the drink mix to make the chocolate tart and followed the directions the same as with the bar chocolate. The tart was still as chocolatey and no sweeter than when I used the bar chocolate. I just didn't have to grate the chocolate.